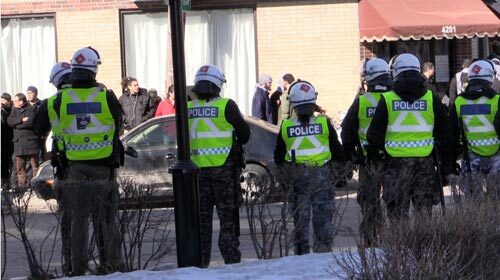 PEGIDA in Canadian media, vs Eye Witness Report with Photos: Communists against PEGIDA, and police in riot gear to protect people from the Communists. PEGIDA in Canadian media, vs what I saw. seemingly to protect people from the Communists. from, it seems, the Communists and others with them. On Sunday, March 29, 2015, I went to one event. 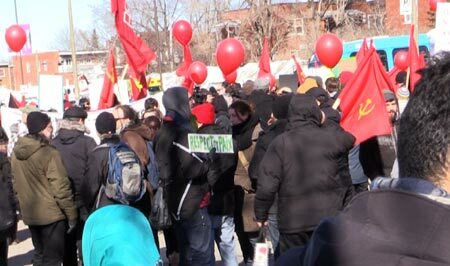 It was to be the first-ever Pegida event in Canada. The media reported something entirely different, showed none of what I saw. My conclusion: this was yet more evidence that we need a media of our own. Communists against Pegida - 200 or so Communists, and hangers-on. In 3 groups. 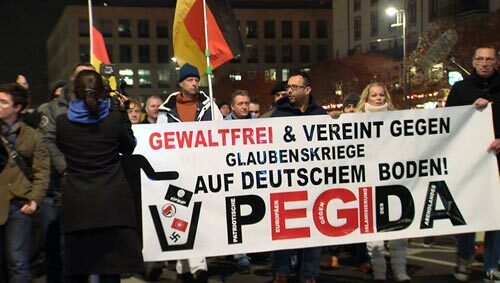 Pegida didn't show. The demonstration (rally?) was supposed to be from 4-6. I got there around 3 with a friend who was willing to come with me - nice and early so we could have a chance to talk with the Pegida organizers, as well as see who else was there. We found 2 groups, one on each side of the road (in the parking lot). One with obvious huge Communist banners (hammer and sickle). But the other group also had a couple of signs that had a kind of Communist sound. We talked with them - Trotskyites. The 2 groups were going to unite for the rally, but stood apart, because they had differences from each other (according to a Trotskyite). An army of police officers lined up facing the smaller group. There were maybe 50 police cars in a group in the parking lot. Riot police were clustered around the corner in a lane, about 8 people dressed up as if for Star Wars, one holding something that looked like a futuristic gun. My friend and I hung around, kept hunting for anyone associated with Pegida. We found an Islamic center with maybe 30 men hanging out outside it. No people (or almost none) who looked as if they were unaffiliated with the 2 groups. My friend asked one of the demonstrators (from yet a third group), are you a student? The answer: No, I'm a revolutionary worker. Where are the Pegida people, I asked a couple of people. Are you a fascist? was the answer. Are you a fascist? it came again. My friend laughed and said, yes, sure, we're fascists. Someone called her a Zionist fascist - meaning they knew she was Jewish, so she got the double name-calling. We kept going around. The police seemed friendly, but did not want anyone in the road - you had to be on one side or the other. That made sense, if they were afraid of clashes in the road. 4:05. Still no sign of Pegida. We got into the car, but circled the shopping center where the demonstration was supposed to take place, just to see if we could find even a hint of Pegida. At 4:15 we were behind the demonstrators in the car (walled off from them - cars could not get all the way there). An announcement came from the police: Pegida has cancelled. 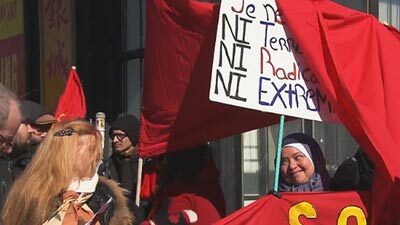 "Pegida a annulé." Then a repetition: Pegida has cancelled. I'm glad we went to the rally. It was interesting to see the people who were ready, quickly, to come and chant. And then the question: who pays this piper? Because it's my assumption that whoever is leading at least the large group gets some money. It's not Putin who's paying - Russia is no longer a Communist force. I don't think it's China. Saudi Arabia? It could well be some Islamic group, is my guess. A friend thought the Communists were funded by the unions - very rigidly politically correct. Anyway, I'm very glad to have been at the Pegida event that did not happen. It made total sense to me that Pegida chose not to meet a couple of hundred people ready to rage against them. The next day I found several mainstream reports of the event - of an event I did not attend. They mentioned "anti-racist" demonstrators. They did not mention that there was a massive police presence, seemingly to restrain the feared violence of these "anti-racist" protesters. 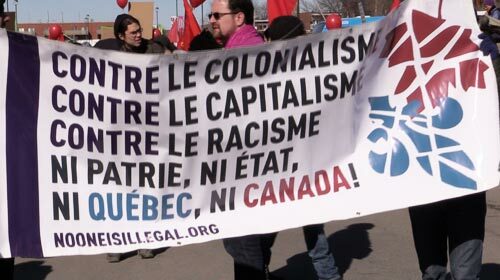 They did not mention the heavy Communist, anti-capitalist, anti-colonialist, anti-Canada nature of the banners. PS. For a comment and more thoughts, click here. Here's the start of what popped in to my inbox: "When I was in service, the usual demonstrators were very similar. Back then . . . "